Priced: $79.99 - $125.00 Rated: - 5 stars out of 5 by 10 reviews. Tackle trails with swift precision in the Salomon Speedcross 3 shoe. This men's outdoor shoe features a water-resistant synthetic and anti-debris mesh upper. The Quicklace™ system secures a customized fit, while Sensifit™ technology wraps the foot in comfort. The synthetic lining wicks away moisture and an Ortholite insole provides stability as well as antimicrobial protection. The aggressive Contagrip rubber outsole of the Salomon Speedcross 3 trail shoe lends exceptional grip and durability in mud, snow and challenging terrain. FEATURES of the Salomon Men's Speedcross 3 Shoe. SPECIFICATIONS of the Salomon Men's Speedcross 3 Shoe. Update to the Speedcross 2, SKU#7332253. The men's Salomon Speedcross 3 Shoe is an update to the iconic, lightweight, aggressive trail racing shoe. The Salomon Speedcross 3 is the update to the iconic, lightweight, aggressive profile, trail racing shoe. Feather construction. Anti-debris mesh upper to avoid debris getting trapped. Water resistant textile, mud guard. Sensifit™ cradles the foot for a precise fit. Quicklace™ one-pull lacing system ensures a secure and customized fit. Lacing system is easy-on and easy-off. Lace pockets store Quickfit™ locking mechanism and excess Kevlar laces safely out of the way. Molded EVA/Injected EVA midsole. Mud and snow non-marking Contagrip® outsole. Wt. 10.2 oz. Offering featherlight construction, water resistance, and the convenience of Quicklace™ Technology, Salomon's Speedcross 3 is an iconic, lightweight, agressive profile trail racing shoe. When conditions are extreme, the Light Weight Muscle Chassis works with the injected and molded EVA midsole to give you support, while the Contagrip® outsole takes on mud, snow, and loose gravel. OrthoLite® footbed keeps things cool and comfortable inside, even when conditions have everyone else breaking a sweat! Lightweight trail speed is the name of the game for the Speedcross 3 from Salomon. Update to the iconic, light weight, aggressive profile, trail racing shoe. To preface my review, I shoot USPSA practical pistol and wear these as an alternative to actual football or baseball cleats. I have also worn them on a few trail runs. As an owner of some XA pros from Salomon, when I went looking for a more aggressive almost cleat-like trail running shoe, I knew I had to give Salomon a look. 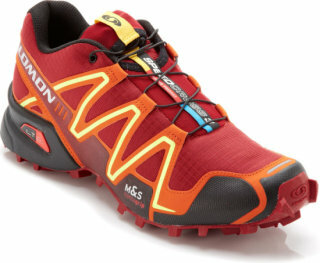 The Inov8 Mudclaws are a very popular shoe in my sport, so they were on the list. My very positive experience with my XA pros and general love of Salomon's styling led me to jump for the Speedcross 3's even considering the higher price point than the similar Inov8's. I have very high arches and issues with overpronation, so the ability to put in my own orthotics was important. For my high arches there simply was not nearly enough support for me. Your mileage may vary. Upon taking them out of the box, I immediately noticed how aggressive the tread was, and I was very pleased. Comfort wise I give the Speedcross 3's a four simply because after extended wear my heels really start to feel pain that I don't get out of my XA's. However, what I love is that the midsoles on these things are very springy and especially when I plant hard into a shooting position, and I feel them compress and dampen that impact. As someone who is not a runner, I can't really comment on its merits as a running shoe. I can say that the few times I have run in them it was a pleasure. I have used these on rocks, wet grass, dust bowl type environments, wood, concrete and everything in between and have had zero traction issues. I feel way more confident doing explosive movements within a course of fire and can focus on shooting rather than whether or not I can safely maintain my footing. I've been running for over 30 years and my feet are what I would consider normal. The Salomon Speedcross 3 shoes fit like a glove. I was concerned about the aggressive tread on road use, but the tread is soft and the impact is unnoticeable. I love the speed draw shoe laces. It ensures a even fit, no gaps. It's too early to report on durability, but if it's like my other Salomon hiking shoes which I've had for 3 years now with little wear, I don't foresee any issues with it. The only thing I would warn about is the arch support. I have normal arches, so it wasn't an issue, but from an non-experts opinion, it might not have enough arch for those who need it. I love these shoes! I ran 14 miles right out of the box in these shoes. Two days later I ran a 50K in these shoes, trail, wet conditions, with 4,000 feet elevation change - these shoe crushed it. My feet felt great. A better fitting shoe than the Salomon Wings 4 shoe I had previously ran in. I have narrow feet and these are perfect. Light weight. Water resistant/ easily repels water from the toe cap region. I highly recommend this shoe to anyone into trail running. They are probably not necessary for your three miler in the park, but absolutely necessary for ultras. God's speed! These are fantastic shoes. They are light and comfortable with an aggressive sole that clears the dirt with ease. One word of caution for the wider foot runner: the forefoot is a little narrow which crowds the toes. I currently train in a size US8 Salomon Xr CrossMax 1 which are wider in the forefoot and fit me like a glove. I will have to increase the shoe size to US8½ to accommodate the narrower fit of these shoes. Unbelievably comfortable! I have to admit, it was not my 1st choice because I got used to mainstream brands; however, once I tried these on I was hooked! These are truly the most comfortable shoes I have owned. Fit true to size and are also very light. Now I am busy collecting them in other colors. Definitely worth a try! I ran in these shoes for my first time and they are AMAZING!! Great traction and I was also impressed with how they protected my feet from rocks on the trail. These shoes feel much better on the trail and be aware they have a narrower fit. LOVE THESE SHOES!! Have been trail running in these for 3 months and they are great. Feel good out of the box. Lacing system allows for a nice snug fit around your feet. Lightweight, solid, great for technical terrain and stable for letting them loose downhill. Excellent in dry or wet weather. Great arch support with amazing traction. Fits a narrow foot well. Light weight shoe that can be worn at any distance from a 11 mile to 50 mile trail run. Liked from the moment i put them on. Although they are comfortable and soft they are very reliable on each step. Also waterproof while running in snow. Reccomend! Shoe fits true to the size . Excellent all day comfort.